This is Invention #5 from the book of J.S. 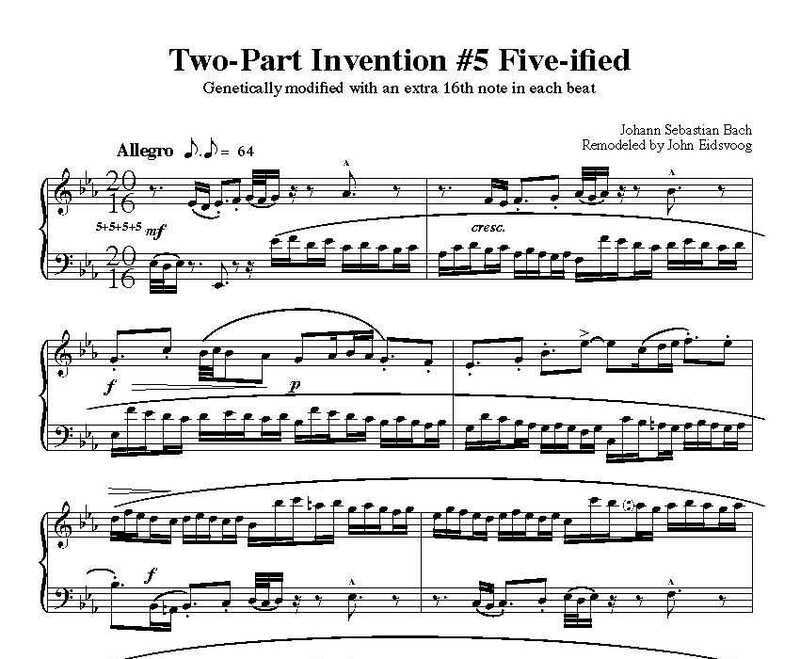 Bach’s Two-Part Inventions Five-ified which have been metrically modified in favor of five by composer John Eidsvoog. Bach’s original version of this invention was in 4/4 time, but John has added a 16th note to every beat, changing the groups of four 16th notes to groups of five 16th notes. The result is a refreshing, remodeling of this famous 2-part invention in 20/16 time! This invention is available in the complete book of Two-Part Inventions Five-ified at a significant savings from buying all of them separately. Choose either Download Version or Printed Version ($1.00 extra).